Tim Wellens (Lotto Soudal) repeated his great performance from last year when he rode away to a solo victory in the queen stage of the Eneco Tour. The Belgian attacked from a select group of favourites on a wet descent and rode strongly to the finish to put 49 seconds into Greg Van Avermaet (BMC). The Belgian also took the overall lead with a comfortable 1.03 margin over his compatriot. Last year Tim Wellens took the biggest win of his career when he surprised all the favourites in the queen stage of the Eneco Tour. On a course that resembled a small version of Liege-Bastogne-Liege, he dropped everyone with a strong solo attack and laid the foundations for the overall victory. This year the defending champion had flown a bit under the radar in his home race after he rode a very poor Tour de France. However, he showed that he had recovered well from his travails in the French race when he did a surprisingly good time trial and yesterday he gained more time on his rivals when he made a big coup alongside Wilco Kelderman (LottoNL-Jumbo). That moved him into second among the pre-racing favourites and made it clear that he was one to watch in today’s queen stage which was another small edition of Liege-Bastogne-Liege. Due to his good position on GC, he would be heavily marked though so it was always going to be difficult to repeat last year’s performance. However, this time Wellens didn’t need any kind of luck or tactical advantage as he simply turned out to be the strongest rider in the race. He put in a dominant ride to take a big solo win and a big advantage in the overall standings as he goes into the final stage. At the start of the final lap of the 27.1km finishing circuit that included four climbs, Wellens found himself in a select group of favourites with his teammate Tiesj Benoot, Julian Alaphilippe (Etixx-QuickStep), Philippe Gilbert, Greg Van Avermaet (BMC), Christopher Juul (Tinkoff-Saxo), Diego Ulissi (Lampre-Merida), Nikias Arndt (Giant-Alpecin), Fabio Felline (Trek), Alexey Lutsenko, Andriy Grivko (Astana), Kelderman, Tom-Jelte Slagter (Cannondale), Jose Joaquin Rojas (Movistar) and Jan Bakelants (Ag2r). They were chasing 15 seconds behind Simon Geschke (Giant-Alpecin) and Michael Rogers (Tinkoff-Saxo) who had attacked after a very hectic and hard phase of the race. On the Cote de Saint-Roch, the hardest climb of the race, it was Felline who set a hard pace that sent Arndt, Ulissi, Benoot, Rojas and Kelderman out the back door. Apparently, no one had the legs to attack until Bakelants made one of many attacks. Wellens, Felline, Van Avermaet and Juul were the first to join him and later Lutsenko, Gilbert, Slagter and Grivo also made it back while Kelderman was suffering further back. Instead it was the wet descent that made the difference. 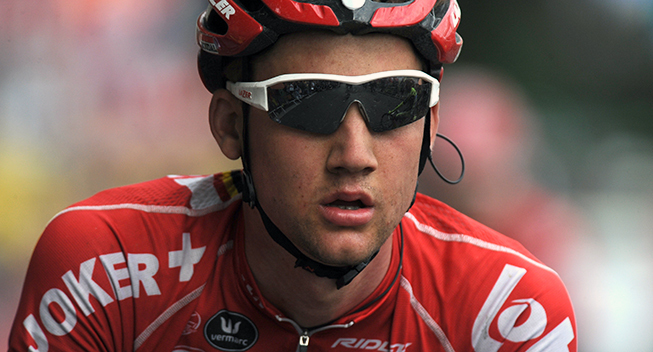 Bakelants took off and Wellens joined him. Unfortunately, the Ag2r rider had a mishap and fell back to the chase group while Wellens made it back to Rogers and Geschke just as they hit the next climb. Here he went hard right from the bottom and after Rogers had first been dropped, Gschke also had to surrender. Meanwhile, Benoot and Kelderman managed to fight their way back to the main group. A very strong Wellens had managed to extend his advantage to 25 seconds as he reached the summit of the climb and the start of the golden kilometre. Rogers and Geschke were both brought back and instead it was Van Avermaet who attacked. He was briefly joined by Juul and Gilbert but managed to drop both to take second in all three intermediate sprints. Gilbert took third in the two first sprints while Felline was third in the final one. Van Avermaet fought hard to get back to Wellens but after the gap had been stable at 15 seconds, he started to lose ground. Furthermore, there was no cooperation in the main group where Grivo, Juul and Bakelants were among the many riders to try. With 14km to go, Juul had made another attempt but it was the counterattack from Geschke that worked. He started to get closer Van Avermaet who was now 40 seconds behind while the peloton had been distanced by a minute. Wellens crested the summit of the final climb with 11km to go with similar advantage and had now gone into TT mode. Meanwhile, Slagter and Bakelants attacked from the main group and started to approach Van Avermaet and Geschke who joined forces with 6km to go. Despite working well together, they were losing ground to Wellens who had an advantage of 50 seconds when he hit the final 4km. From there, he rode strongly to take a solo win before Van Avermaet beat Geschke in the sprint for second 49 seconds behind. Bakelants dropped Slagter in the finale to take fourth while Gilbert led the main group home with a time loss of 1.13. This was enough for Wellens to take the overall lead with an advantage of 1.03 over Van Avermaet who moves into second. Kelderman drops to third, 14 seconds further adrift. Wellens still had a big challenge ahead of him in tomorrow’s final stage which is like a mini Tour of Flanders. The course includes a total of 17 famous hellingen and ends with an uphill sprint on the Mur van Geraardsbergen where Van Avermaet sprinted to the win 12 months ago. After yesterday’s mini Amstel Gold Race, the terrain got even harder in the queen stage which brough the riders over 208.6km from Heerlen to Houffalize and was like a mini Liege-Bastogne-Liege. There was a total of 15 climbs on the menu on a day full of ups and downs, including the famous and very steep Cote Saint-Roch that they would do thrice. In the end, they did two laps of a 27.1km finishing circuit that included four ascents but the final 10 kilometres were mainly flat. It was a cloudy day in the Netherlands when the riders gathered for the start in Heerlen. Two riders were absent as Sky lost Ian Stannard and Chris Sutton overnight. As most expected, the stage got off to a brutally fast start with numerous attacks and it took time for the early break to be formed. Hence, it was together at the first Primus sprint which was won by Gijs Van Hoecke (Topsport Vlaanderen) ahead of Cedric Pineau (FDJ), Thomas Sprengers (Topsport Vlaanderen), Jesper Asselman (Roompot) and Dylan Groenewegen (Roompot). Hence, the Topsport rider took the virtual lead in the sprints competition. The attacking continued for a while until the elastic finally snapped when Jan Polanc (Lampre-Merida), Matthias Brändle (IAM), Nikias Arndt (Giant-Alpecin), Sebastien Turgot (Ag2r) and Jerome Baugnies (Wanty) escaped. When they hit the Schuttebergsweg climb after around 30km of racing, they had an advantage of 1.40. LottoNL-Jumbo took control of the peloton and led the group onto Belgian soil with a delay of 3 minutes. They kept the group firmly under control and on the Malmedyerstrasse climb, it was still only 2.50. The peloton slowed down a bit in a flatter section and when they hit the Cote la Ferme Libert after 80km of racing, the gap had gone out to 5.10. It stayed around that mark as they tackled the Cote de Wanneranval as the final climb before an easier section led to the first passage of the finish line. With 100km to go, it was exactly 5.00. Rick Flens and Maarten Tjallingii had been given the task of controlling the pace for LottoNL-Jumbo and kept the gap between 4 and 5 minutes as they approached the first passage of the finish line. Meanwhile, their teammate Robert Wagner worked his way back to the peloton after a puncture. Just as they hit the Cote de Saint-Roch after the first passage of the line with 70km to go, it started to rain and that made the descent treacherous. Baugnies set a fast pace on the ascent to distance the rest, with Polanc and Brändle being his nearest chasers. However, they were back together as Baugnies waited after the top. In the peloton, Andrey Amador (Movistar) launched the first attack but Jempy Drucker (BMC) quickly shut it down. Juul was the next to try before Viacheslav Kuznetsov (Katusha) started to ride on the front. Behind, the peloton was exploding to pieces. Kuznetsov, Juul, Dayer Quintana (Movistar), Lutsenko and David Tanner (IAM) got a gap before they were joined by Grivko and later also Van Avermaet and Bakelants. Meanwhile, Quintana was dropped from the group. Kelderman knew that this was a dangerous move and so he chased hard on his own but he never made it across. Instead, his teammates Jos van Emden and Maarten Wynants started to chase hard and got some help from Tom Boonen, Fabio Sabatini, Yves Lampaert and Nikolas Maes from Etixx-QuickStep. Benoot managed to bridge the gap after Georg Preidler (Giant-Alpecin) had made a failed attempt and the group had now opened an advantage of 30 seconds. Meanwhile, the gap to the front group was melting away and was just 1.35 as they entered the final 60km. The Van Avermaet group was losing ground and it was just 5 seconds as they hit the bottom of the Cote de Saint-Roch for the second time. Baugnies again split the front and crested the summit to win the final Primus sprint, followed by Brändle who joined him at the top. Arndt made the junction on the descent. Van Avermaet went full gas in the chase group which dropped Kuznetsov. Instead, Kelderman, Wellens, Gilbert, Alaphilippe, Rojas, Geschke, Felline, Ulissi, Manuel Quinziato and a Topsport rider bridged across. Turgot dropped back to that group and worked hard for Bakelants until they hit the next climb. Here Van Avermaet launched a big attack that only Bakelants, Wellens and Kelderman could match while Quinziato, Tanner, Turgot and the Topsport rider were dropped. Grivko, Lutsenko and Alpahillipe made it back to the Van Avermaet group while Felline, Gilbert, Juul, Geschke, Rojas, Benoot were chasing further back. Ulissi, Slagter and Rogers managed to join that group before they caught the Van Avermaet group. The attacking continued as Grivko, Wellens, Van Avermaet, Lutseno, Alaphilipe, Ulissi and Arndt were among the many riders to give it a try after they brought the front trio back. However, it was Brändle who made the difference with a solo attack 45km from the finish. Juul worked hard behind the Austrian who extended his advantage to 15 seconds. The Dane got an unintentional gap but Van Avermaet brought him back with another attack. The Belgian tried again and while Baugnies was distanced, he sprinted past the fading Brändle. Van Avermaet was caught at the top of the final climb of the circuit where Geschke made a move. He got an immediate gap while Rogers and Lutsenko took off in pursuit. The latter was dropped while the former managed to join Geschke after a long chase. Gilbert, Benoot, Grivko, Wellens, Felline and Bakelants briefly formed a promising group but they were brought back with 34km to go. However, the attacking was taking its toll on Keldeman who found himself with Van Avermaet, Ulissi, Brändle and Arndt in a group that had been caught out. However, everybody apart from Brändle made it back with 32km to go. The attacking continued when Van Avermaey, Bakelants, Alaphilippe, Wellens, Gilbert and Juul escaped. Kelderman was left to do all the work in the chase group before Felline bridged across. The race leader made it bac to the main group just as they started final lap where the action continued before Wellens rode away with the win.